Today my friends I have two more cards made with the set talked about in my previous post. 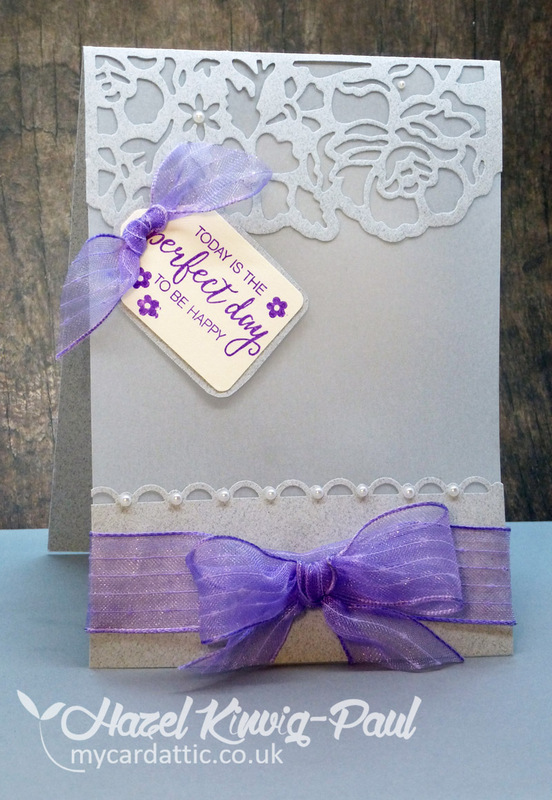 The first is a fussier card, which would be suitable, for special occasions. 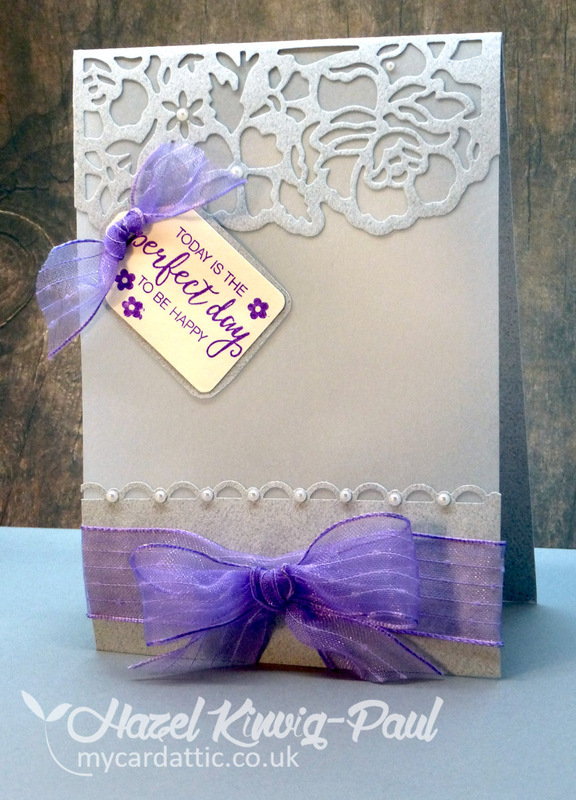 It is a soft grey and uses a vellum panel, ribbon and pearls for a dreamy, romantic look. 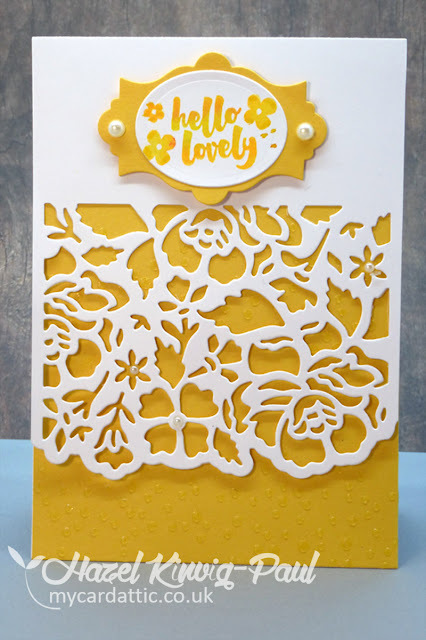 The second is a more straightforward design done in sunshine yellow and translucent embossing paste for a more contemporary look (I'm not sure you can see the embossing paste in the photos, but I will try to show it in the close up). I also used a contemporary sentiment for it. Here is the first. I'll be back as soon as I can with the next two cards in this series. Absolutely lovely cards on this post (and the last one) using that die. Both cards are lovely! My favorite has to be the yellow one...it's so bright and just pops off the screen!! 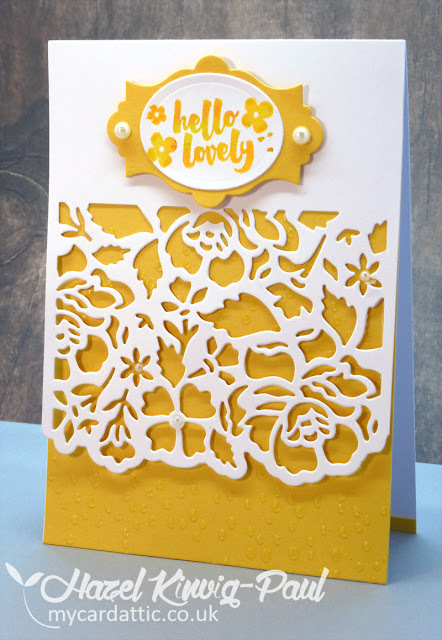 Two completely different looks with same die-cut design !! First one ,elegant ,pretty and second bright n sunny ! I loved both ! Beautiful cards Hazel. The first is indeed very dreamy and romantic. I love the paper you have used there for your die cut. The second is lovely and bright in that yellow. 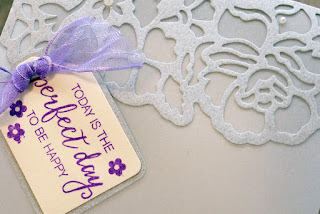 And yes we can see the embossing paste very well, looks nice. Oh my...both of your cards are just so beautiful. 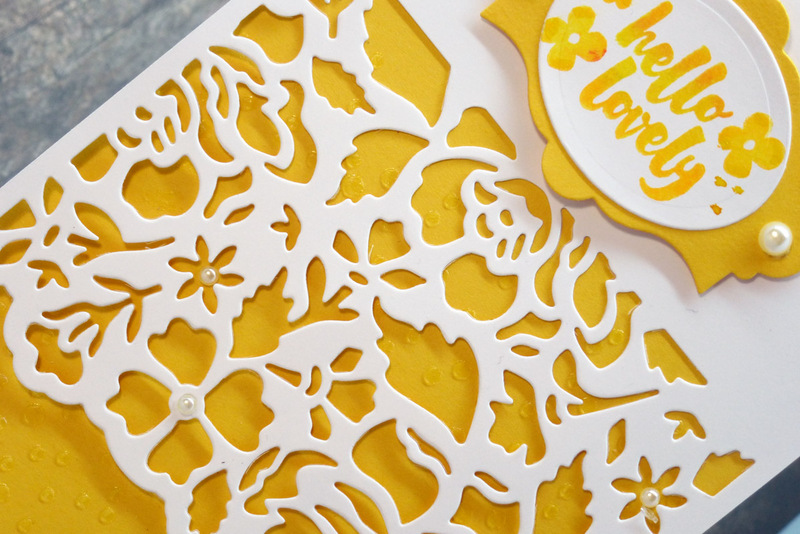 Love that gorgeous lace look you created. So beautiful and so elegant! These are both gorgeous, Hazel! 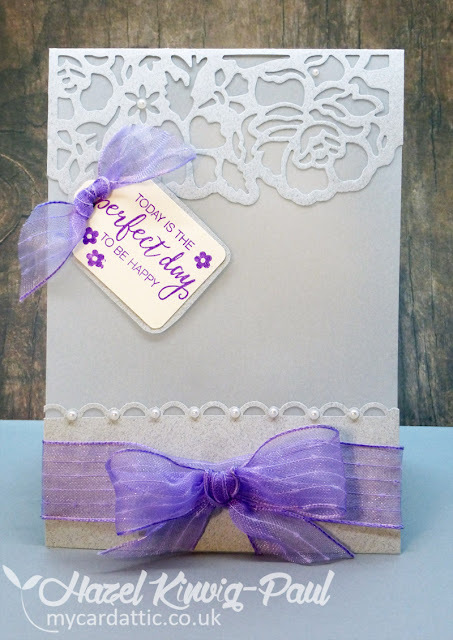 I love the overlay on the beautiful card stock , what a fun die! Two more beauties using this die! I'm getting some wonderful inspiration here, my friend! Thank you! Oh, you are really putting that wonderful die to great use, Hazel!!!! The first card is so stylish and elegant - the soft grey and the little pearls are so lovely and the scalloped edge is beautiful!!!! The lovely purple bow is simply gorgeous!!! For sure a lovely romantic look, my friend!!!!! 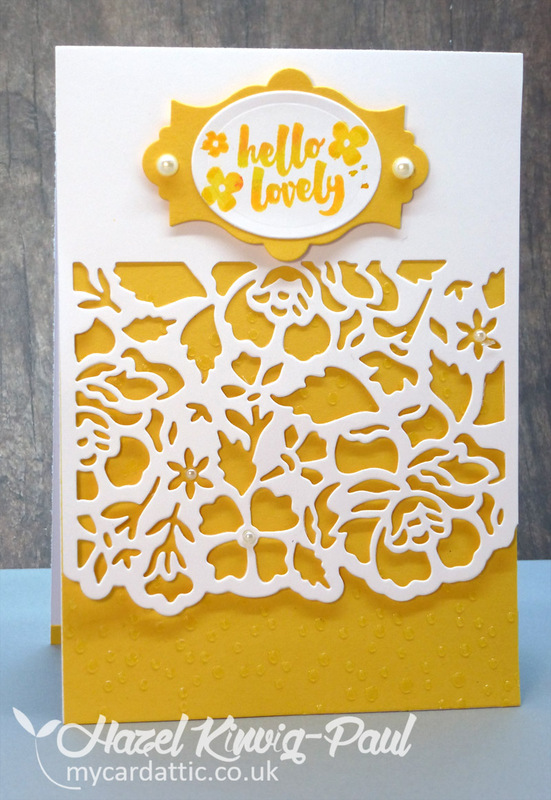 The second card is so cheerful and sunny and fabulous with the die cut against the bright yellow!!! Both wonderfully done!!! Have a great day, Hazel!! !